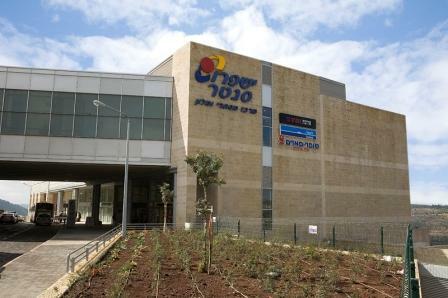 As I continue to probe, seeking to learn and pass information to readers, I am increasingly pleased with the progress, but admittedly somewhat frustrated at the seemingly endless issues that must be presented to you, the subscribers, seeking to reach a true understanding of the ins and outs of kashrut in general, and in Israel in particular. 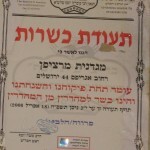 As one of the regular readers [and a person with way more than average knowledge of kashrut and halacha] pointed out to me today, I neglected to address the matter of chezkat chalavi, the status of a parve item that has been exposed to a dairy setting, perhaps eliminating its true parve status. This is not just theory but applicable fact, as was confirmed to me by Rabbi Shimshon Blumenthal [I remembered to inquire as to his first name today] at Neeman Café and SamBooki in the Hadassah Ein Kerem Mall in Jerusalem. 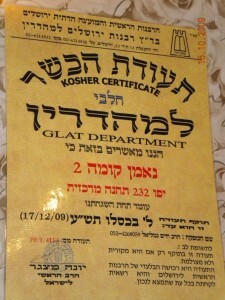 The rabbi went on to confirm that if the Jerusalem Rabbanit Mehadrin sign reads “chalavi” (“dairy”), then one must assume even the parve items, such a rugelach, are not to be used in a meat setting and the laws of separation from meat and dairy are applicable. The rabbi explained we are not just addressing a matter of cold utensils used from dairy to parve pastries as customers fill their bags, but because “there is significant difficultly controlling the tray situation” the decision was made to label everything dairy. Please understand, the parve and dairy pastries that are sold arrive in the ready-for-oven frozen state, and then baked off, offering you fresh goods. If the same trays are used to bake dairy and parve [even sometimes] you run into major halachic issues. My point is to make you aware and act as you see fit while also remembering the rule is if the sign reads “dairy” one is to assume the products are indeed not suitable for a meat environment. There are also bakeries in which I have noticed the clients are haphazard in their adherence to the separation of dairy and parve goods, especially in self-service bakeries. Many moons ago, I worked in a bakery in Washington Heights (NYC) under the supervision of what is now known as KAJ. The display trays even had separate colors, and the clients did not serve themselves. There were totally separated/ divided showcases, and each bag/box had to display “parve” or “dairy”. 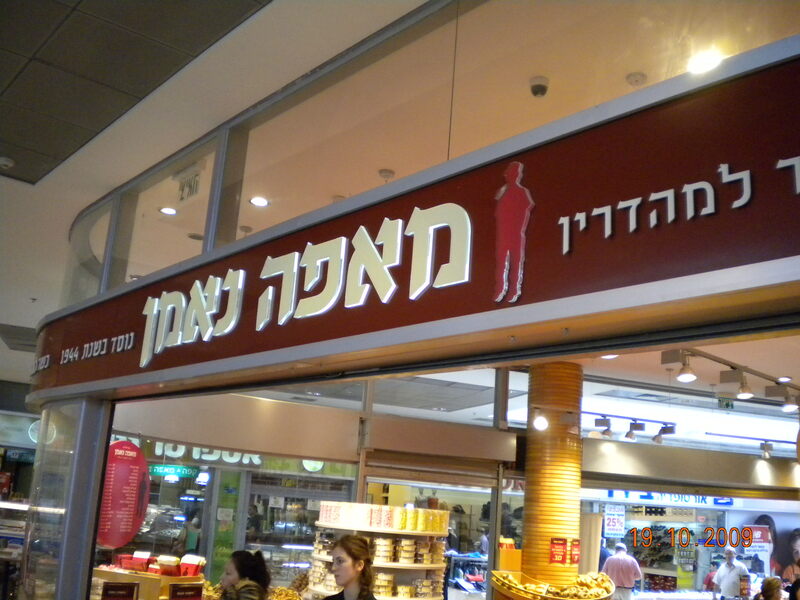 This is true with Angels (regarding labeled bags and boxes) but not so in many other places, such as Marzipan Bakery on Agrippas Street (Badatz Beit Yosef), where nothing is marked to indicate “parve” or “dairy”. 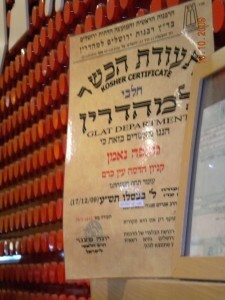 Actually, most boxes do not even exhibit the Beit Yosef seal and one receiving an item from the bakery has no indicator as to the kashrut standard. 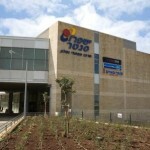 On that note, meeting with the decision-makers at Beit Yosef this week and hope to drive the point home. Who knows, perhaps they will be accommodating and see the validity of my concern. In the worst scenario, adding the Beit Yosef logo to the bakery’s bags and boxes serves as advertisement for the kashrut agency so I hope they will compel the change, as well as the “dairy” and “parve” labeling. Anyway, in conclusion, be alert, and ask if uncertain. If you see the dairy and parve pastries are mixed together, customers using the same implements for both, it is cause for thought/concern. 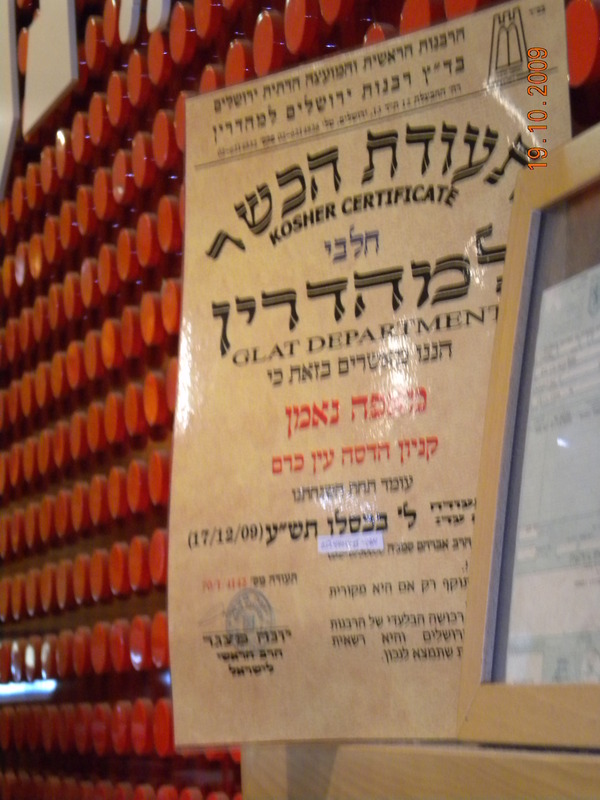 Perhaps the veteran subscribers recall sometime ago I reported on the bakery in Center 1 which displayed a very small sign that announced the challah for shabbat was chezkat chalavi. 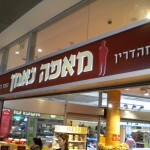 When I questioned halachically objectionable practice, since most of us serve challah at a meat meal, the sales clerk exhibited a perplexed expression, informing me there was a sign, which by the way was so small my modest camera had difficulty picking it up. 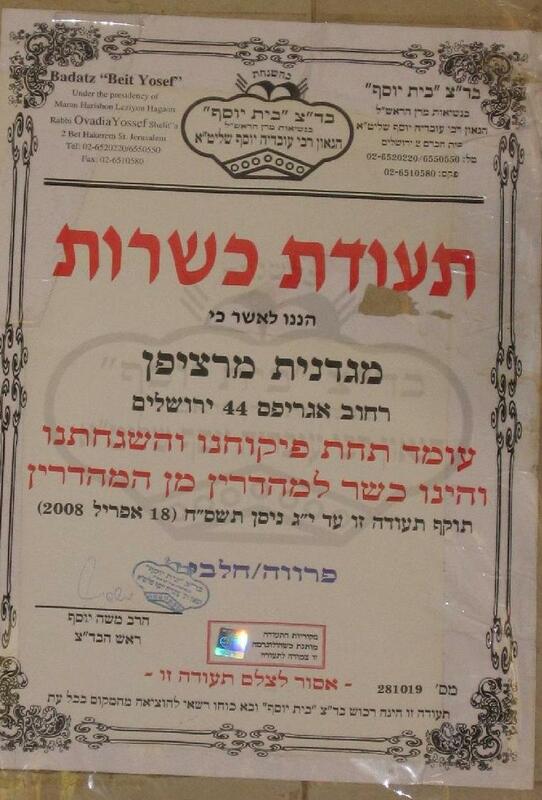 I double checked the Jerusalem Rabbinate Mehadrin certificates from the Central Bus Station as well, as the ones at Neeman Café and Corus (same company) are indeed dairy their too! Posted on October 20, 2009 by JKN Israel. 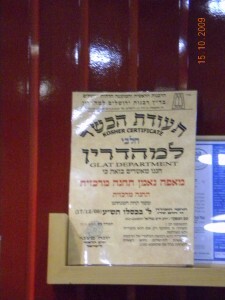 This entry was posted in Jerusalem Central Bus Station, Restaurants. Bookmark the permalink. I was taught that if it is marked “b’chetzkat chalavi” rather than “chalavi l’chalutin” [=completely milky] or just “chalavi” [=milky] then the restriction is that one should not eat it together with meat but one may eat it after meat even in the same meal. This once applied to our local Neeman bakery before they completely separated between parev and milk. Does this apply to the scenarios you talked about here? You are correct. Chezkat Chalavi does not mean Chalavi. There is a makhloket between the Mechaber & Rama on how to treat pareve food that was cooked on ben yomo milchig keilim (YD 94:5). For Ashkenazim, we don’t eat the food together with meat, but we can eat it separately even at the same meal –> no need to wait. 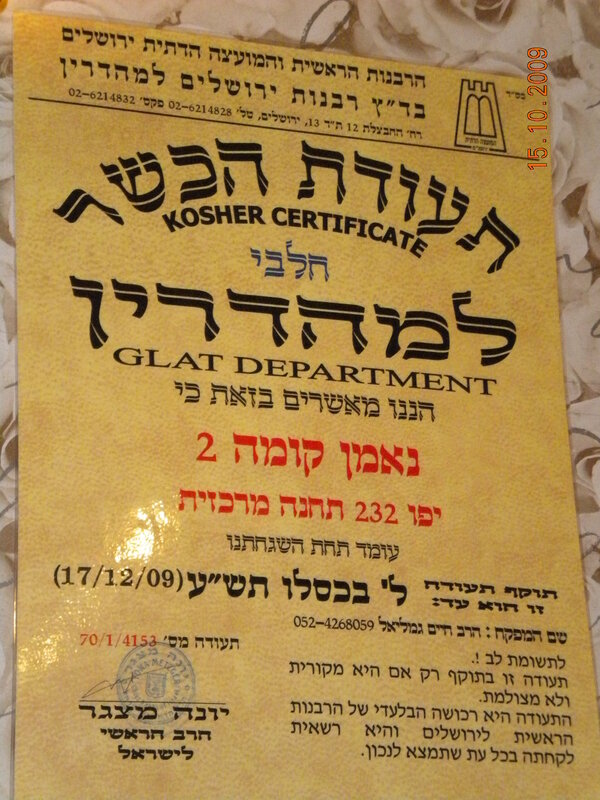 L’maaseh in bakeries that serve both, one could ask the mashgiach about how particular they are that the trays are clean. If there is mamashos of milchigs on the tray, it could be an issue. But the bottom line is that pareve means pareve, with the exception of eating it with meat mamish. Also, I don’t agree that it is an area of concern for someone to be using the same implements for both milchigs and pareve when serving pastries. A tong that touches a cheese danish does not make a pareve rugelach milchigs. I carelessly typed in the wrong numbers for the source in Yoreh Deah.. The simon is tzeide heh –YD 95:2. You sure keep us on our toes! I would like to add about the issue regarding Chezkas Chalvi-Rav Avraham Yosef (son of Rav Ovadia, Rev of Cholon and member of the motezes chachamim speaks on the radio every week giving a call in Halacha class. (Fridays at nine on Radio Kol Chai). Just mention chezkas chalvi in a professional sitting and he starts to rant! He says there is no way there can be chezkas parve in a chalvi place, it is assur to sell milchig bread (or serve in a non home setting) and that people should complain about such places. He cites the same reasons you do, and that is why in a home we allow what we will not allow in a resturant or bakery.